After pondering the characteristics of environments that, unfortunately, we’re all familiar with — Authoritarian and Legalistic v-Meme sets that dominate a large part of our world — you’re probably looking for a little hope that higher level leadership is even possible. The good news is that it is. Work environments that, at some level, prioritize performance can evolve. The common denominator that starts the process may not be as appealing to the idealists in the crowd. What is that common denominator? Believe it or not, it’s money. Money is a great generator of information coherence inside an organization. It’s an external measure of performance. People are only going to buy your product if they want to. And money comes from customers. And interaction with customers, through their diverse personalities, is going to drive empathy development — especially rational place-taking — throughout a given company. Continuing along this track, we can also see that industries that rely on customer preference also have the greatest potential for empathetic development of their employees. It’s no wonder that oil, gas and mining companies are chronically running afoul of varieties of public opinion. No one really has a gasoline preference nowadays, other than regular/premium. Whereas companies with semi-infinite supply chains (like aerospace) or ones driven by consumer preference (like selling tennis shoes) are more likely to have accelerated empathetic development. And once again, companies with larger empathetic backgrounds are much more likely to have avenues where servant leadership can develop. 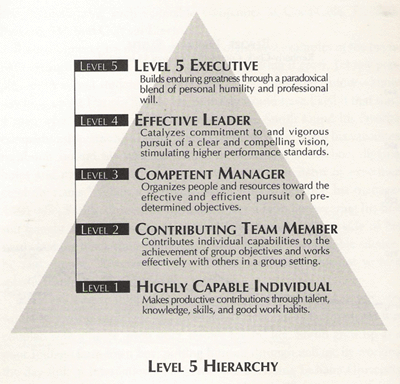 Let’s put up Collins’ Servant Leadership pyramid and do a little examination for the Performance v-Meme in his levels. Collins explicitly prioritizes making money as part of his tripartite prioritization of the Hedgehog Principle. So it should come as no surprise that one of the primary characteristics of a servant leader is to service that one thing the company does well as a vehicle for creating economic value. And every level of his management development schema emphasizes performance. Let’s review, one by one. Level 1 — the person themselves must be capable of performance and being productive. Level 3 — Efficient resource manager implies a perspective toward optimal resource allocation, as well as the first nod toward multi-solution thinking. Optimal is inherently going to be time dependent, and means evolving the operation to current market conditions. And that means multi-solution thinking, which comes out of an environment where rational place-taking, with its nonlinear connections, is encouraged. Level 4 — Interestingly enough, this level implies a larger level of emotional empathy with individuals that they work with. It is impossible to catalyze commitment from people who sense you do not care about their larger well-being. Level 5 — Finally at Level 5, we establish enduring performance and embodiment of larger care and concern for more aspects of his/her employees lives (and even destinies) as critical. And the only way for an individual to do this is to develop those larger temporal and spatial scales in their own head that are possible through empathetic development. We can also start seeing that Design Thinking starts coming into play, from Level 3 on up — if the objectives that Collins is referring to are generated in part from their customers. In short, the Performance v-Meme, along with Design Thinking at the higher levels, is ingratiated into Collins’ model. Along the way, Collins emphasizes indirectly the need to build community along with this. Employees are individuals, and optimal performance can only be drawn out of those people with some level of independent connection and knowledge through leadership. Yet at the same time, Collins’ model, originally published in his book in 2001, shows some element of age. Is there servant leadership, and corporate performance, beyond his definition and the Hedgehog Principle? The Hedgehog Principle itself, requiring a company to do one thing well, should draw your suspicions. Within the last 15 years, much has changed with companies that aspire to SOTA performance. That not only they do well (with solid profits) but they also do good. What kind of leadership gets us there? Takeaways: Collins’ model of servant leadership, while having nods to higher Spiral levels above Performance/Communitarian, and showing some appearance of the Coral/Bodhisattva v-Memes, is, like all our structures, a creation of knowledge structures of our time. It’s true that servant leadership is a huge step up from the tired Authoritarianism of the past. But there are (and always will be) higher levels to aspire to.